You've probably seen endless gift basket sites promoting gifts and gift baskets for every occasion and theme that you can think of, so what makes ours better? Although we certainly want to make sure that the finished product is gorgeous, we have our own twist to designing gift baskets. If at all possible, we will include useful products instead of just decorations to carry out your theme. For example, we'd rather add a teabag squeezer to the edible contents of a tea themed gift basket than tea themed cellophane as it will be of much more use to the person receiving the gift. There, "in a nutshell" is the reason we produce better gift baskets. We give each of our baskets very personal attention at each step of the way. We shop the trade shows to provide you with the best buys in gourmet foods and gift items possible so that you will get "more bang for your bucks!" This, of course, is also the reason that we can truthfully claim that we are selling better gifts. Our designs are carefully built with theme, color scheme, and budget in mind so that neither you nor your recipient will be short-changed on either the looks or the actual content of the gift basket that you send. Customization is another service that makes our gift baskets better gift baskets. We realize that the more a gift basket can be tuned to the intended recipient, the more it will reflect your sentiments and care in choosing the gift. This is why we are happy to work with you to customize your gifts. At times this will be possible using our in-house inventory, but in other cases we will have to shop for special items to include. Please remember that both costs and time involved will necessarily increase in those instances. We do not ship chocolate during warm weather as nobody wants a basket full of melted chocolate! If only chocolate will do and you need to have the gift shipped between May and October, it will have to be packed with ice packs and arrive at it's destination in one day's time. As this is often extremely costly we don't recommend it, but if you need a gift basket hand delivered in the Worcester, MA area, we will be happy to provide your recipient with all the chocolate he or she may desire. We do require the recipient's phone number so that we can arrange delivery when someone will be available to receive it. 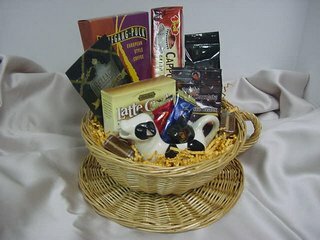 We would like to remind those company officers responsible for business to business gifting that the designs shown on our Christmas and Hanukkah gift baskets page are just suggestions. While you are more than welcome to purchase a stock design, we would prefer to work with you to make your gifts reflect your company and your recipients much more effectively. To that end, we can even provide ribbon printed with your logo and/or your company name. We reserve the right to replace any item that is out of stock at the time of your order with one of equal or greater value. Since you will usually be ordering a gift for a specific holiday or occasion, we want to make sure that your gift arrives in a timely manner. If you choose to order on-line, our shopping cart payment options are Visa, MasterCard, Discover, American Express, and Paypal. If you would prefer to order off-line, we accept the above credit cards or would be happy to send an invoice via PayPal. Please call 508 864-5079 or use our toll-free number, 1-800-558-0807, if you are using a land-line and are beyond our local calling area. Our normal business hours are 10 AM to 7 PM EST Tuesday through Sunday. Another option is to print out and mail in our Order Form along with your cashier's check or Postal Money Order.